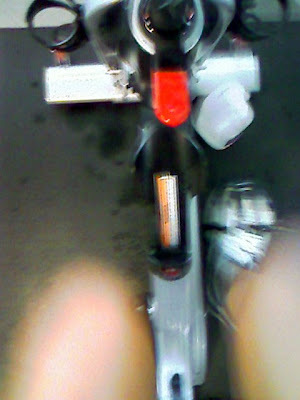 I think I've found a new love at the gym today when I stepped on a stationary bike for a weekend workout! An hour later, I was in love. Blame it on a surge of endorphins surging through my brain. Sweat dripped freely from my arms, hands, forehead and chin onto the floor and down my chest (don't worry, I wiped the machine down before and after use with disinfectant). By the time I was done, my entire tank top was soaked except for two bottom corners. I had merely wanted a short ride before circuit training. After 20 minutes of riding I thought I'd use my heart rate monitor to get an analysis of my workout. I'm a numbers person and enjoy finding meaning from them--especially when it comes to my cardio routine. 10 minutes went by...then 20 minutes went by and I thought, okay...I'll just ride to 30 minutes. A few more minutes later I was close to 40 and wanted to keep going even after realizing that I had been riding for just over an hour. But the days' errands were calling so I needed to pry myself away from the gym. Besides, I did more than I had planned to do. A workout that would make my cycling husband proud. Now I understand why he enjoys it so much and how he easily shedded almost 40 pounds off of his 6'0" frame. I think I have to get a road bike and take this party on the wide open road!